William Hilton [Hillton] was christened in Manchester Cathedral 4 Oct 1761 and was buried at St John Manchester 25 Apr 1804. He married Ellen [Elin] Smith 8th May 1791 at the cathedral. At the time he was a small ware manufacturer and lived until his death at 24 Oldham Street. 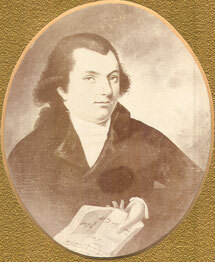 His parents were James Hilton (1724 - 1784) and Mary Ashworth (1740-1785) both from Manchester and married there in 1761. James's father William had been christened in Eastham, Cheshire in 1691 and married Ellen Rushton in 1718 in Prestbury. His father William was born in Warrington circa 1646 and seems to have arrived in Eastham around 1671. He married twice, Alice French (1670-1687) and Susannah (d 1692), mother of William. The earliest generation of Hiltons known was Francis, father of William. He was born 1638 Manchester and died 4th March 1685 and is commemorated by an inscription in Manchester Cathedral which describes him as a chapman (itinerant seller).